On this page you will find a directory of our properties on offer for sale in Ubud. To go to the page of the property of your interests, please click on the pictures of that certain property or click on the button that says “More information”. 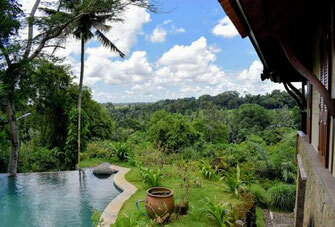 Beautiful mountain boutique hotel for sale North of Ubud. A resort with views over the mountains, rice fields and a valley. Guesthouse for sale with 7 spacious bedrooms. Located in Penestanan, about 10 to 15 minutes walking from Ubud center. Tegallalang villa for sale including a rental license. The villa is having 5 bedrooms but it is possible to create an additional bedroom. 2 Bedroom villa for sale in a villa complex. A villa suitable for permanent living or for renting out. Management available. An unique Balinese resort with true character on offer for sale at the outskirts of Ubud surrounded by rice fields only. Modern styled villa for sale with beautiful river and valley views. A property with totally 3 bedrooms and a large piece of land. A Freehold 5-Bedroom furnished Villa on 800 m2 in the small village of Payogan . 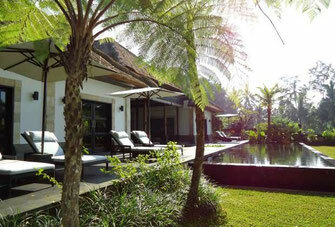 These stunning duplex villas are located in a village just 5 minutes south from Ubud.